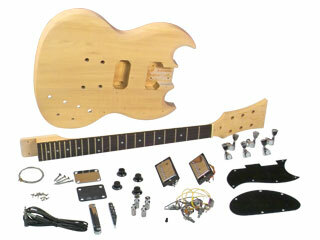 Free Shipping on all Saga Guitar Kits. Creating a real Custom Shop musical instrument masterpiece is easier and less expensive than your customer would believe with a popular Saga Instrument Kit! All the contours, critical angles, and pre finishing work has been completed, eliminating any guess work and the possibility of making an unplayable instrument. So simply designed and crafted that no sophisticated woodworking tools, complicated jigs, or soldering are required. Detailed instructions are included to make the process simple.